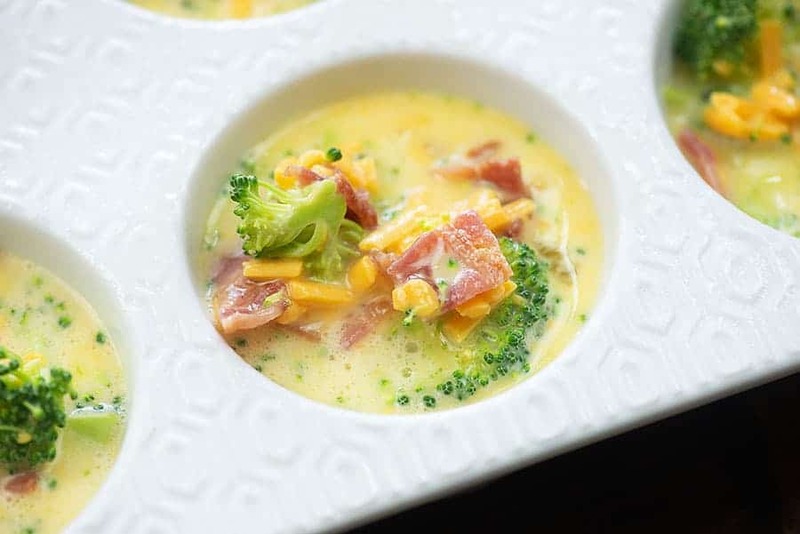 Frittata muffins, loaded with fresh broccoli, crispy bacon, and plenty of sharp cheddar. These are great served warm, but we eat them straight from the fridge for a quick breakfast, too! Packed with protein and just 1 net carb, these make a healthy breakfast. I have such a bad habit of letting my kids eat junk for breakfast. We homeschool, so they’re here all day, every day. This means that I’m responsible for all three meals + snacks. I just don’t usually have it in me to wake up and start my morning off in the kitchen. They resort to junk for breakfast and I feel guilty about it. One of my goals has been to prep breakfasts in advance so that they have healthier options waiting for them. Luckily for me, today’s healthy option just happens to be keto-friendly and SO dang good. I’m obssed with this mini broccoli frittata and you’ll see me hoovering these into my face straight from the fridge. Yep! They’re even tasty cold! This keto frittata could not be simpler to make! You’ll start with 6 large eggs. Whisk ’em together with some heavy whipping cream. Next up, stir in some diced, fried bacon and some chopped broccoli. 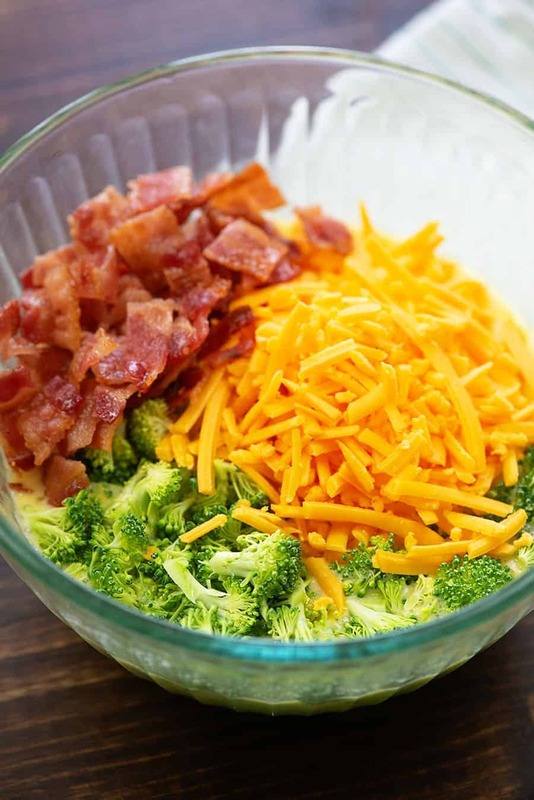 There is no need to par-cook the broccoli as it will get perfectly tender-crisp in the oven. Do be sure to chop it up into small pieces, though. Stir in some grated cheddar. What is life without cheese? 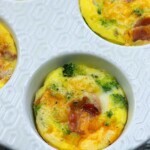 We’re making frittata muffins here, so you’ll want to grab a muffin tin and hit it with some non-stick spray. 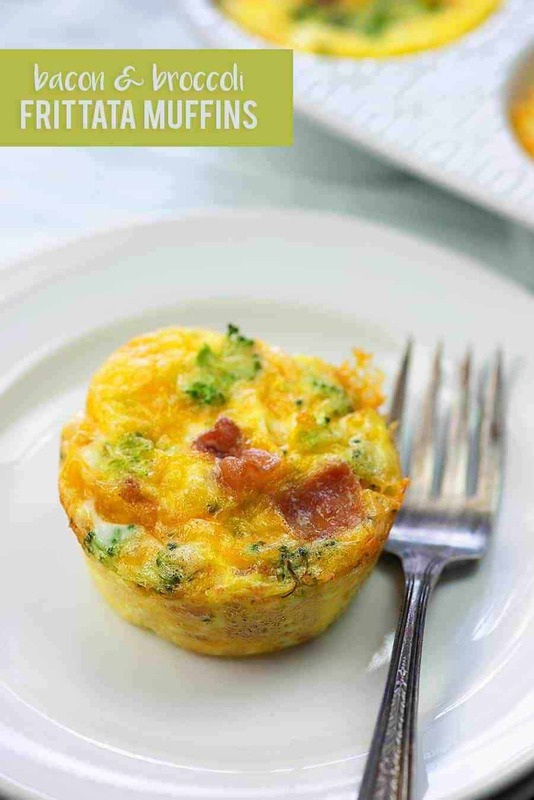 Pour the broccoli frittata mixture evenly between 8 muffin wells. 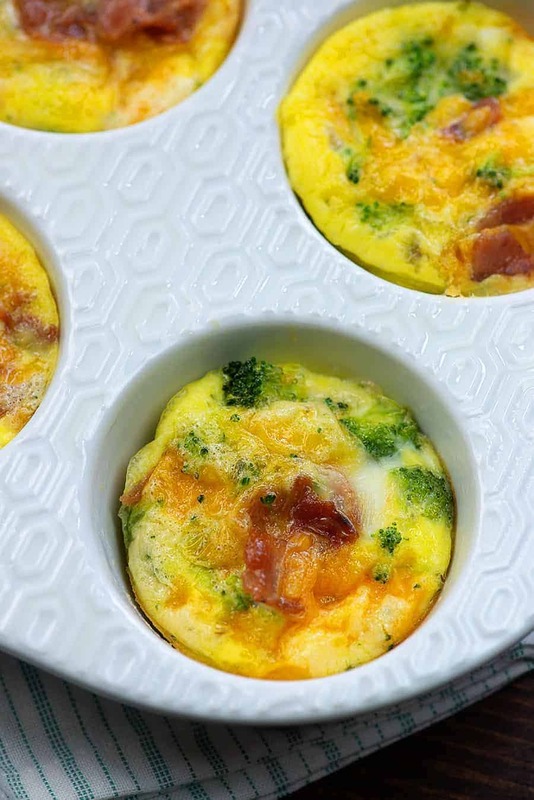 This isn’t tricky, but you’ll want to use a spoon to be sure you’re getting a little broccoli, bacon, and cheese into each muffin along with the egg. Pop these into the oven and your bacon frittata muffins will be ready in just 20 minutes. Like I said, these are fabulous served hot, but they’re every bit as good served cold. This keto frittata is perfect for making ahead as a grab and go breakfast option. These egg frittata muffins have just 1 net carb per muffin with 11 grams of protein and 13 grams of fat. Perfection! Brussels Sprouts and Bacon: Love this low carb side dish. Garlic Butter Shrimp: Ready in no time at all and bursting with flavor! Steak Bites: If you’re intimidated with cooking steak, this is the perfect way to ease into it! Plus my marinade is perfection. Cauliflower Chicken Fried Rice: Skip the takeout and eat this healthy version! 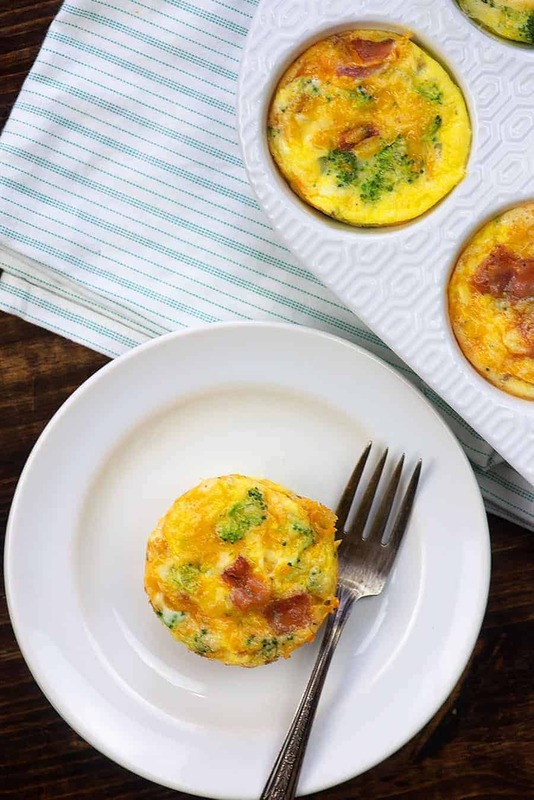 These frittata muffins are packed with crispy bacon, broccoli, and sharp cheddar. They make a great make-ahead breakfast and can be served warm or cold. Preheat oven to 350 degrees. Spray a muffin tin with non-stick spray. Whisk together the eggs, cream, salt, and pepper in a medium mixing bowl until well combined. 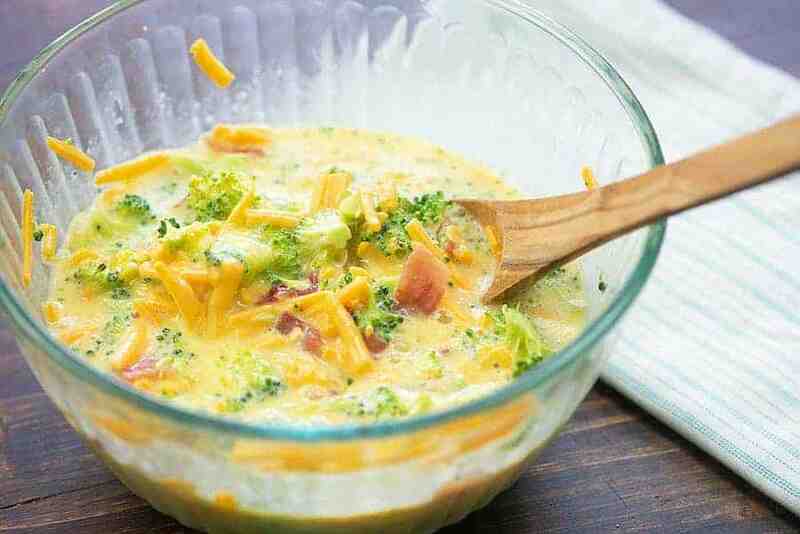 Stir the broccoli, cheddar, and bacon into the egg mixture. 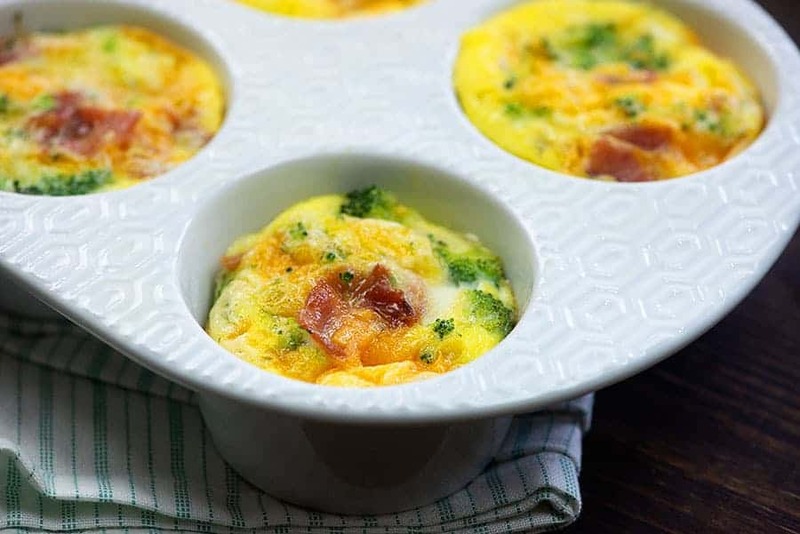 Pour the mixture evenly between 8 muffin wells, being sure to get the broccoli, bacon, and cheese evenly dispersed throughout. Bake for 20 minutes or until the eggs are set and the edges are pulling away from the muffin tin. Cool for 5 minutes before running a knife around the edges of the muffins and removing. May I ask where you got the muffin psn? Jalapeno sounds like a great addition! They should freeze fine, though I haven’t tried it myself. I’ve never tried it, so I’m not sure. I am excited to try these. I was wondering if you could use regular milk instead of cream? Yep, it’ll just change the nutrition info.